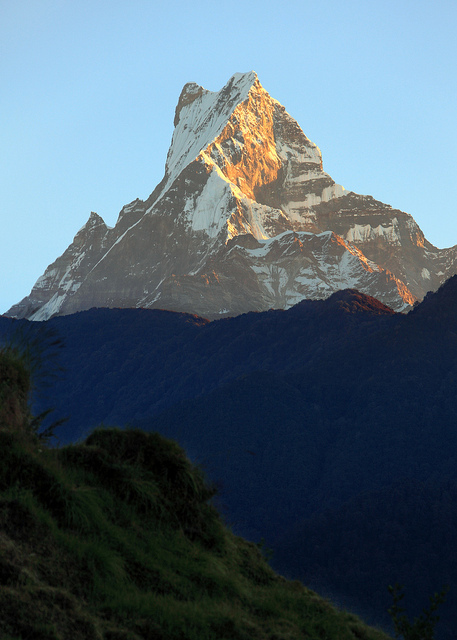 It was mid-morning before a minivan arrived to take us from Pokhara to the starting point of our 10-day trek. By then we’d gathered the rest of the travelers in our group – six total including me, supported by a guide, an assistant guide, a cook, and seven porters. It turned out to be an interesting cast of characters. I’d already met Elie, 56, from Belgium. 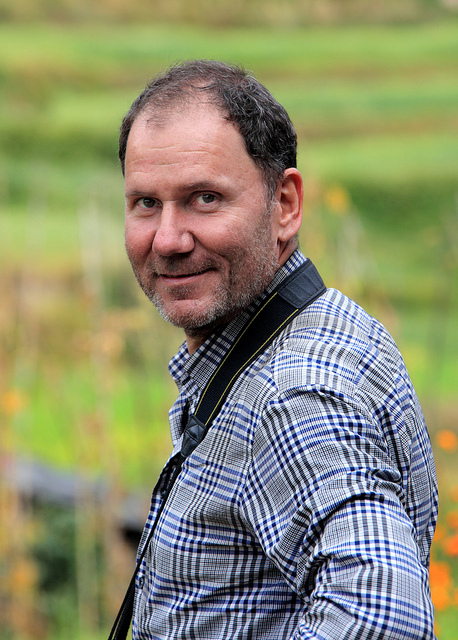 Elie said he makes a habit of taking a month-long trip every year, always concentrating on just one country. Over the course of our first few days, Elie listed all the countries he’s visited and pronounced each one to be amazing (“Indonesia… Have you been there? Amazing country. Sri Lanka is an amazing country. Costa Rica, also amazing. Jamaica… You know it? Amazing.”). I’d also already met Shawn and Penny, two 21-year-old friends from Denmark. 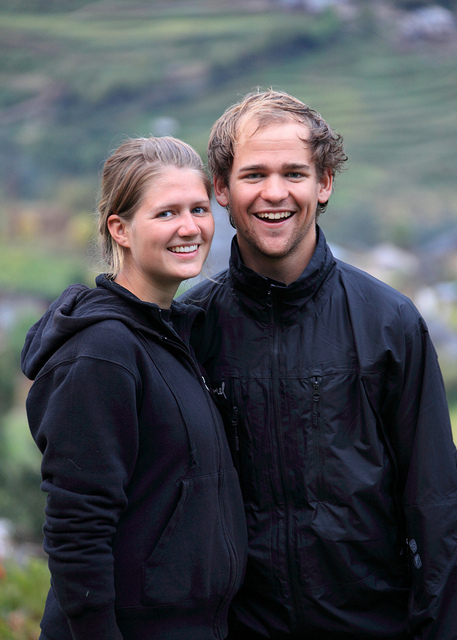 They’d been in Nepal for a few weeks, living with a local family and doing different kinds of volunteer work. They both spoke excellent English, slang included. When Shawn joked with the locals, which was most of the time, he tended to slip into a mischievous, high-pitched little-kid voice. Penny was still limping on her injured feet, but she said the pain killers were doing their job. That morning we were joined by Tato, 27, from Sao Paulo, Brazil, and Ursus, 47, from Switzerland. 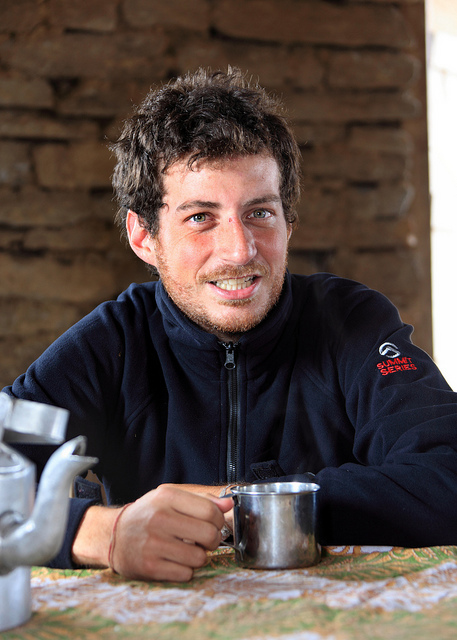 Tato had been traveling around India and planned to head back there to work for Ashoka, a non-profit organization that sponsors social entrepreneurs. Tato said everyone in his immediate family is a psychologist, and his mom really has two jobs – in addition to being a professional psychodrama therapist, she also performs Jewish-themed stand-up comedy. But Tato said he’s more interested in public policy and government. I quickly learned that it didn’t take much to get him fired up if the conversation happened to turn to politics. 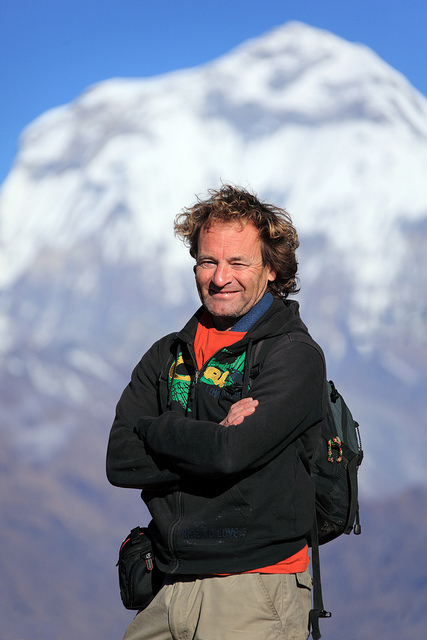 Ursus was in Nepal for the second time this year. In the spring he did the Mustang trek and liked it so much he came back to try another. He makes his living running a small advertising agency, and in addition to his house in Switzerland he has a second home in Brazil, where his girlfriend lives. Ursus was clearly smitten with Eastern religions. He made a point to bow and pray whenever we came across a temple, and during breaks in our hikes he would take off his shoes and sit Buddha-style. 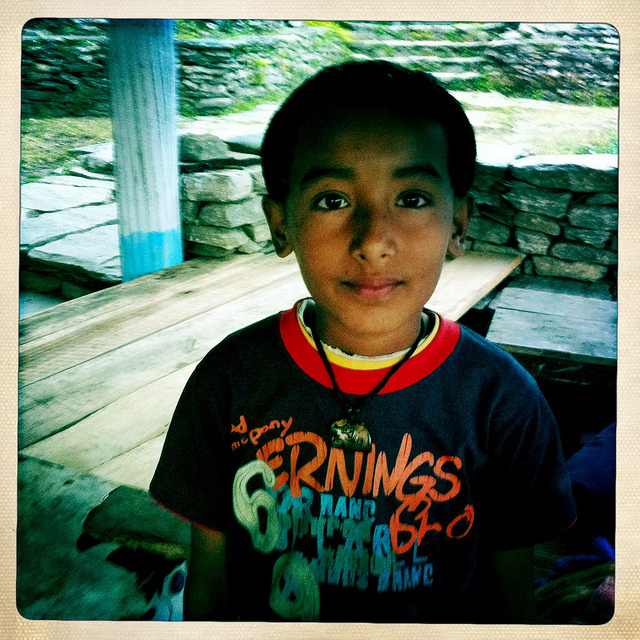 Our guide was Bharat, 27, a Hindu from a village in the Everest region, where his parents still live. Bharat started out as a part-time porter when he was only 14 and gradually worked his way up through the ranks. Early in his career, Bharat said, he slipped while carrying a 70-kilogram pack, knocked himself unconscious on a rock, fell into a stream, and would have drowned if he hadn’t floated into a donkey caravan that happened to be crossing downstream. Just before our trek he’d led a group up to the Everest Base Camp and back. Thanks to the fact that it was prime trekking season, Bharat didn’t even have a single day off before heading out with us. Normally the minivan ride from Pokhara to Nayapul, where we would start our trek, takes about an hour, but – thanks to the continuing Tihal festival – it took us a little longer. Bharat explained that the tradition of children going to their neighbors’ houses to dance for money has expanded to include roaming packs of kids who create human roadblocks on busy highways and then shake down drivers for tribute before allowing them to pass. On the ride to Nayapul we had to pay off about 15 bands of modern day Robin Hoods. We reached Nayapul in the early afternoon and were soon on our way, finally relying on our feet instead of wheels. We tourists carried only a backpack with things we planned to use that day. 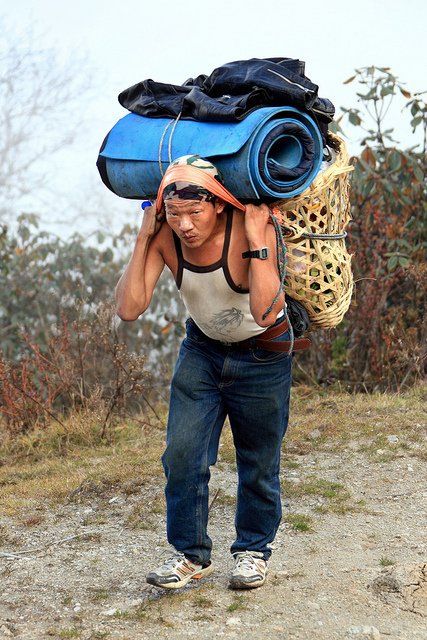 Everything else – sleeping bags, tents, food, extra clothes – went on the backs of the porters, who each carried a massive load, using the typical Nepalese method of wrapping a support strap around their forehead. I find it really curious that almost every country in Asia seems to have its own unique way of carrying heavy loads. 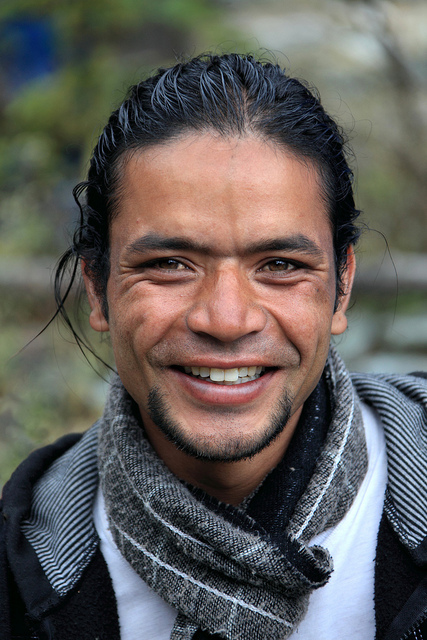 In Nepal, they use the forehead strap. In Cambodia, they balance the load on their head. In Vietnam, they divide the load in two and suspend it from a wooden beam that rests on their shoulder. Because of our late start we only had a few hours of daylight to hike, and – despite moving quickly – we had to stop short of our intended destination. 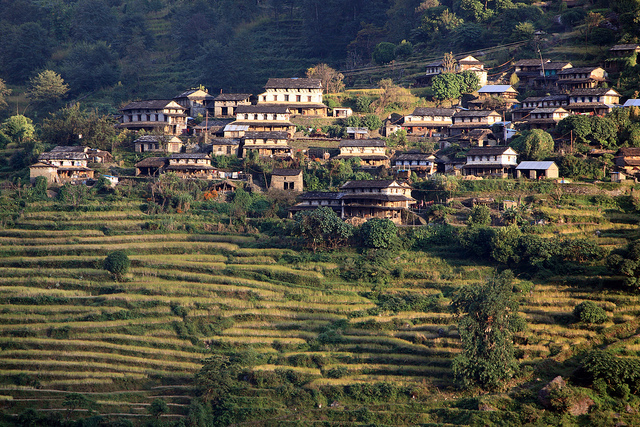 All the trails in the Annapurna region are dotted with trekking lodges called “tea houses” that offer basic rooms and a restaurant. On our first night we stopped at the only tea house in the small village of Kimche. The porters with our tents were meeting us later, so we slept in the tea house that night. I shared a room with Tato (and a mouse), Elie with Ursus, and Shawn with Penny. Overall, a really nice first day. I think we all felt good about our group. 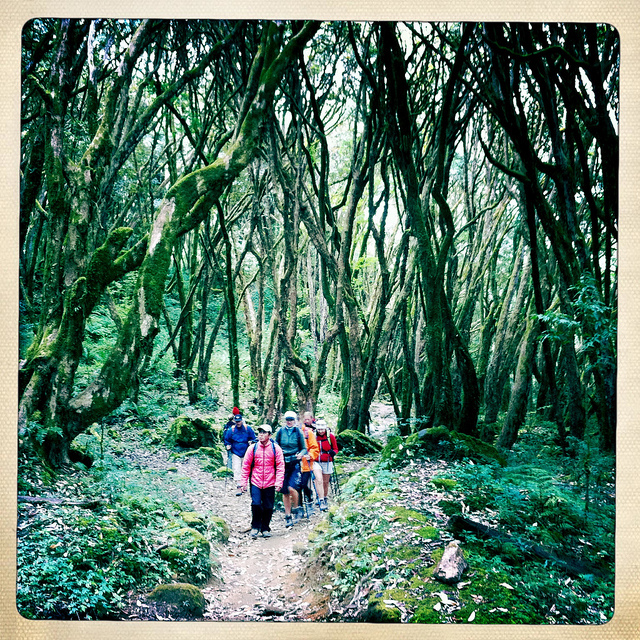 Everyone seemed friendly, and we hiked at about the same speed – no superstars, no stragglers. The late start left us behind schedule, but Bharat said we could get back on track the next day. We woke early, had breakfast, and hit the trail. Sweat soaked my t-shirt when I hiked uphill in the sun, but the temperature dropped as the altitude increased. Clouds rolled in that afternoon and we had to bundle up to stay warm. 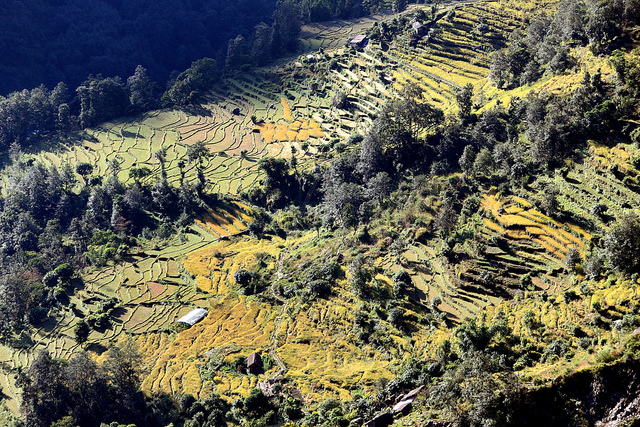 We passed through a whole range of different scenery – fields of terraced agriculture, moss-covered forests, rocky waterfalls. I walked with Bharat that afternoon and asked him about music, assuming I’d hear the same story I’d heard from everyone else in southern Asia (Scorpion, Shakira, and the Eagles’ Hotel California). Sure enough, he mentioned the Big Three, but he also brought up Green Day, the Red Hot Chili Peppers, and U2 – the first time I’d heard anyone in Asia mention those bands. Without a hint of self-consciousness he also said he likes Celine Dion and Enrique Iglesias, and, as usual, it made me happy to talk with someone who is totally unaffected by the peer pressure that usually influences music conversations among Westerners. “Not even Bloodsport?” Say it isn’t so! We hadn’t yet reached the less-traveled trails and we frequently passed tourists headed back down to Nayapul. In the mid-afternoon we arrived at the guest house in Tadapani where we would spend one more night in a room before switching to tents for the rest of the trek. Thanks to our relatively modern accommodations I was able to take a hot shower – the last one I would have for the rest of the trek. In the late afternoon a group of people celebrating the final day of Tihal played music and started dancing outside of our guest house. After dinner another group of Tihal dancers descended upon us. Kids danced for money and adults joined in after downing a few drinks, usually a glass filled halfway with rum and the rest of the way with hot water. They started with traditional Nepalese music and built up to Shakira’s Waka Waka and, oddly enough, Aqua’s Barbie Girl. 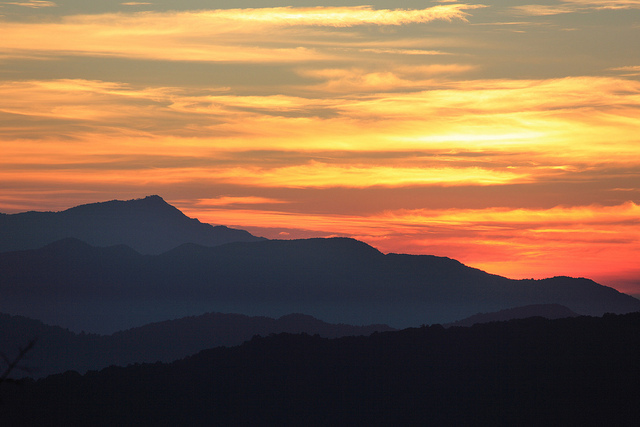 As usual I woke up before dawn for photos and had some luck this time – a beautiful orange sunrise over the mountains. Very rarely did we hike on level ground. When we weren’t going up we were going down, which – at this stage of the trek – always meant we’d have to go right back up again. In the morning the sun kept us warm, but at lunch the clouds moved in and our jackets went back on. We passed a few more tourists in the morning, but starting in the afternoon we had the trail all to ourselves. Tato looked a little startled. “I guess you’re not OK with people criticizing your country,” he said. Later Tato very graciously (and unnecessarily) apologized, which gave me a chance to explain. “People love to hate the U.S.,” I told him, “so I hear lots of criticism and I’m OK with that. I reacted the way I did because for three days every comment you made about the United States was negative, and every comment you made about Brazil was positive. Instead of pointing that out, I let myself get overly annoyed.” I suggested that Tato would have better conversations with people he’s just met if he doesn’t lead off with an uninterrupted flow of criticism. Tato understood where I was coming from and we happily avoided political conversations for the rest of the trek. That night was our first in tents. 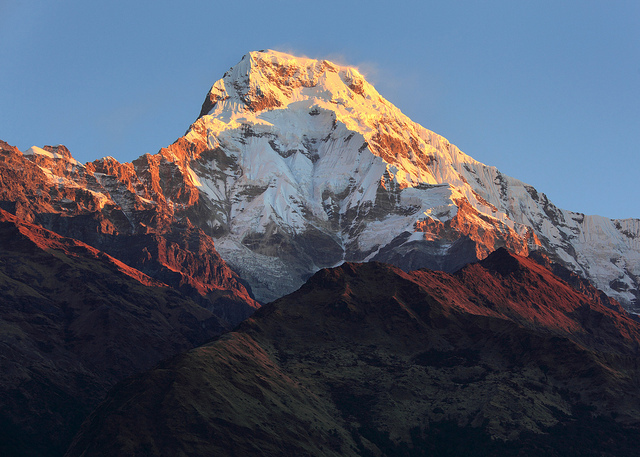 The temperature continued to drop as we climbed, and to stay warm I had to wear my jacket in my sleeping bag. In the middle of the night I got up to go to the bathroom and, despite the cold, stood staring at the sky for a long time. At that altitude, away from all cities and competing lights, the stars were free to put on a real show. And by the way, Shawn's hat in the group photo from day 2 is HYSTERICAL!!! Haha! I love it.